Hello again and welcome to issue 13 of my continuing deep dive into the papers that have caught my eye on Academia.edu. They’re mostly Irish in focus, but other topics and writers that attract my attention are included too. 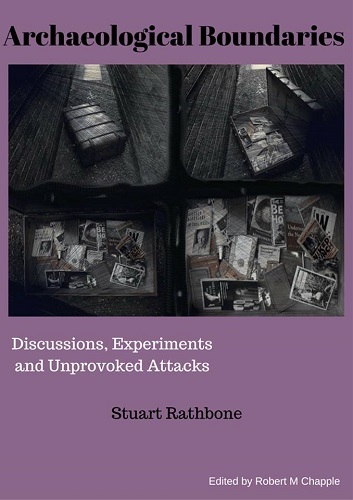 But, before you consider investing some quality time settling into reading any of these, take a moment to acquaint yourself with Stuart Rathbone’s extremely excellent new book Archaeological Boundaries. Discussions, Experiments and Unprovoked Attacks. 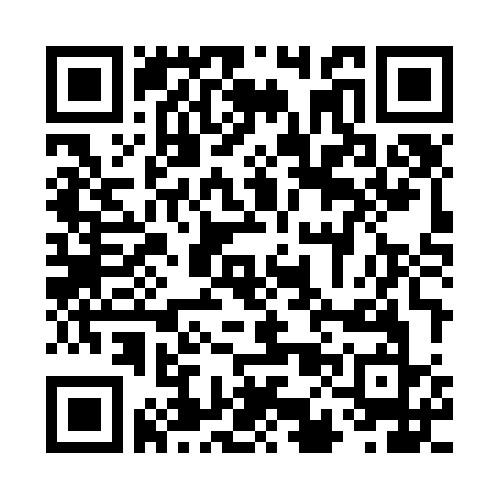 It’s available on the Leanpub site as a downloadable PDF on a pay-what-you-like basis. Who could ask for more? 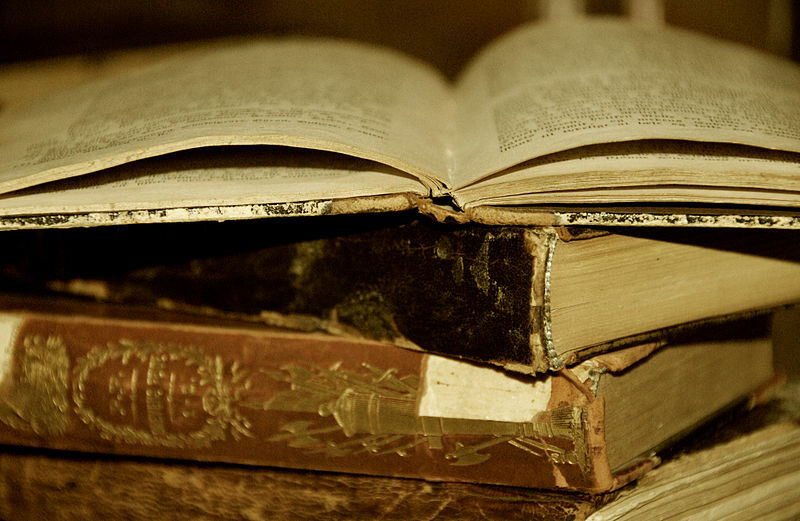 Anyway, here are my latest recommendations – enjoy! Julian Thomas What Do We Mean By 'Neolithic Societies'? Richard B. Warner Láeg's line: a route for the gods? Next to speak was Caitríona Moore. In welcoming her to the podium, Prof Aidan O’Sullivan described her as a skilled and respected wetlands archaeologist. In addressing the question of what the inhabitants of Drumclay ‘made, used and discarded’ she began by noting that over 6,000 artefacts have been recovered, but she only had 25 minutes to cover it all, so she’d better get on! There was a really wide range of wooden items discovered at Drumclay, and the evidence suggests that most of them were made on the site. While she stressed that she wasn’t being competitive, but to put the site in perspective, Deer Park Farms had ‘only’ c.3,500 finds. It is even more impressive when one considers the vast wealth and richness of the finds in comparison to the relatively small physical size of the site. Obviously, this remarkable survival is down to the organic preservation of over 7m thickness of archaeology. The types of items recovered include personal items (pins, bracelets, beads, and combs etc. ), tools and utensils (axes, knives, tools used in textile production, and mallets etc.). Essentially, every aspect of life was represented within the artefact assemblage. The finds assemblage compares really well with other major sites of the same general period, including Deer Park Farms, Knowth, and even with medieval urban centres like Dublin, Waterford, and York. Obviously, the assemblage has much in common with other important crannog excavations, such as Lagore and Ballinderry. Moore then chose to concentrate on the wooden artefacts. As she explained, ‘wood is the building block of Drumclay’ –the physical structure of the site was largely composed of wood and every craft represented here used wood in some way. Within the overall corpus of 6,000 finds Moore argues that the wooden artefacts are particularly outstanding and, as a group, is largely unparalleled. The Drumclay site produced some 1,000 wooden finds, a huge number from a single site. To put that in context, Moore notes that Anglo-Scandinavian and Medieval York produced 1,500 wooden finds – and that was a much larger area than the Drumclay site. Similarly, the large-scale excavations in Waterford during the 1980s produced around 600 wooden artefacts, while Fishamble Street in Dublin was about the same. Moore proceeded to show examples of the kinds of artefacts recovered from the site. These included a small keg with a lug-handle; a carved wooden platter from one of the earliest levels of the site; a wooden trough reused and built into the foundation platform. In the case of the trough, this can be paralleled with very similar finds from excavations in Waterford and the Loch Glashan crannog in Scotland. She next showed an image of the Drumclay cheese mould and explained that although some artefacts don’t always look particularly spectacular when they are first discovered, they can still be remarkably important. It had been discarded at the edge of the site and was later cut into when a post or stake was driven down through it, causing further damage. However, once it had been cleaned up it has become something of an iconic image of the Drumclay site. It has the appearance of a small, squat bowl, about 20-30cm across, and had 10 or 11 perforations in the base. It would have functioned by being filled with cheese curds and, once pressure was applied, the whey would have drained off through the perforations, leaving the cheese. While she showed similar examples from a medieval Italian manuscript and an excavated Roman example, she was quick to point out that she is not arguing for either of these as an origin for the Drumclay example. The base of the press is inscribed with a small Latin cross with expanded terminals. This cheese press without parallel in Irish archaeology. Moore notes that there are a host of traditional beliefs and superstitions surrounding dairying generally - and the production of butter specifically - and she suggests that the inclusion of a cross here was an attempt to ‘Christianise’ some of these practices. There is quite a bit of evidence for woodturning at Drumclay and the artefacts include cups, plates, bowls, and a number of gaming pieces. This is a particularly specialised craft and the evidence of woodturning waste indicates that – at least at a couple of points – it was carried out on the crannog. Moore showed one example of a turned wooden item that had cracked in antiquity and was repaired by being stitched together with copper wire. She notes that, despite the abundance of wood on the site, these remain important and valued items that were repaired rather than being disposed of. There is really strong evidence of cooperage (barrel making) at Drumclay and Moore believes that there may have been a resident cooper on the site throughout its lifetime as staves were recovered from all phases of the site. She showed an image of a workshop floor with several staves – both finished and unfinished – along with some hoops for holding vessels together. 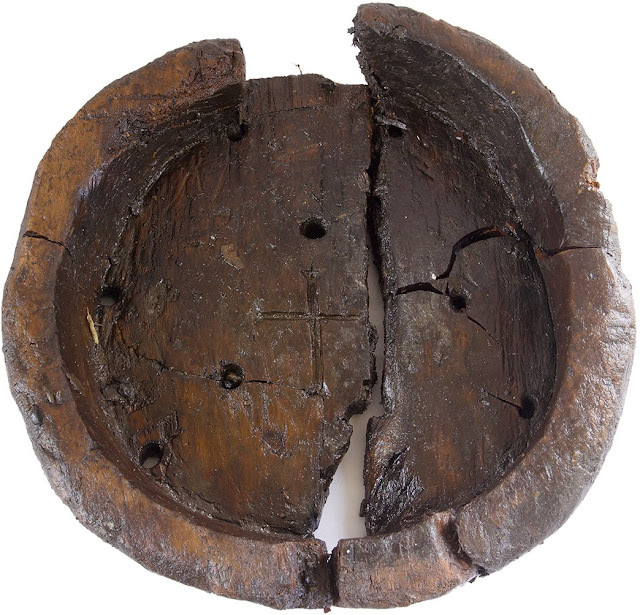 Over 100 staves were recovered from the site along with wooden discs that would have served as the bases and lids for vessels as well as both metal and wooden hoops. Describing it as ‘one of the finest wooden vessels from Ireland’, Moore showed an image of a cylindrical bucket held together with wooden hoops and dowels. She noted that Drumclay produced one wooden bucket with metal fittings and a metal handle that is clearly a high status object. The site has also produced several fragments of decorated wooden vessels. These all came from the same part of the site, though it is currently unclear if they represent one or more vessels. The image she showed was of a vessel with a carved interlace decoration around the rim and poker work decoration on the sides. This is both incredibly fine work and an exceptionally rare survival. Indeed, the Drumclay assemblage of decorated vessels is an important addition to a very small corpus of known examples. She notes that many of the surviving examples come from the north of Ireland and cites a similar example from Cavanacarragh, near Lisbellaw, Co. Fermanagh. Other examples include artefacts from Castlederg, Co. Tyrone; Hillsborough, Co. Down; and Lisnacrogher, Co. Antrim. This group of vessels are all currently dated to the late first millennium AD, but the Drumclay finds are going to offer opportunities to refine and revaluate the dating of the type. Other forms of decoration on wooden vessels include carved and pokerwork crosses. The collection of small domestic pieces include a significant number of spoons. Some appear to be carved, while others may be turned. In the latter case, this would be a much more skilled operation. A number of the spoons also have decorated handles. There are a significant number of finds from Drumclay associated with textile production, while some are of bone, a large proportion are wooden. These include spindles, distaffs, and wooden whorls. Examples of a weaving comb and a weaving sword indicate that loom weaving was undertaken on the site. The weaving sword, in particular, was very finely made and showed delicate grooves along its edge, where the loom threads had worn down the wood through long use. While much of the leather recovered from the site was in the form of waste scraps, a reasonable number of boots and shoes were identified. Related to leatherworking is the wooden shoe last that may be paralleled with one from Deer Park Farms. The Drumclay last is the equivalent to a modern UK ladies size 5 (US size 7 or a European 37-38). Taken together, Moore suggests that there may have been a resident cobbler on the site, or that the residents were regularly visited by one. There are two definite and one possible example of dugout canoes from the site. A number of finds of ‘boat timbers’ (planks potentially attached to the side of the canoe to extend it upwards) and wooden paddles (both complete and unfinished) have been recovered. A significant, if poorly preserved, find is the gaming board from Drumclay. It was broken into several pieces and severely compressed. Although not as elaborate as the famous 10th century example from Ballinderry crannog, it is definitely of the same type. These are known as tafl games and are found in areas touched by Viking influence, including Scotland and Iceland. Similar boards are known from Viking Dublin and at the crannogs of Lagore and Moynagh Lough. Some 15 gaming pieces of different designs have also been recovered. Most are quite simple and conical in shape, but finer examples produced by a wood turner are also known. Once again, they exist as both finished and unfinished examples, indicating that they are being produced on site. 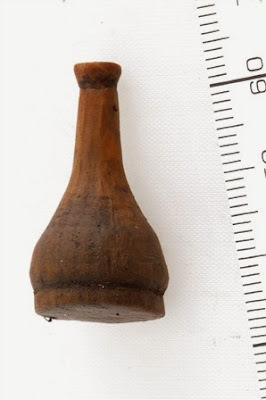 A number of items, interpreted as tuning keys for musical instruments, have been recovered and it is hoped that further analysis of the assemblage may identify other fragments. In her concluding remarks, Moore notes that this presentation has merely scratched the surface of what has been discovered at Drumclay. She also believes that when the full analysis of the corpus gets underway ‘we’re probably all in for a few surprises – I think it’s an amazing assemblage’. Hello and welcome back to the 12th installment of my series on what’s interesting and worth a read in (mostly) Irish archaeology. But first, go check out Stuart Rathbone’s new book Archaeological Boundaries. Discussions, Experiments and Unprovoked Attacks. It’s brilliant and I think it’s one of the most important books on Irish archaeology ever published. Go take a look and then come back for a gander at these! After a short break to grab a cup of coffee and check out the living history displays, we were back in the conference hall for the second session, this time chaired by the incomparable Prof. Aidan O’Sullivan. The first speaker of this session was Dr. Nóra Bermingham, who completed her undergraduate degree in archaeology at UCD School of Archaeology, followed by a Master’s degree at Sheffield, and a PhD at Hull. These qualifications, together with her exemplary experience in the field of wetland excavation, made her the perfect choice as director of the Phase 2 excavations at Drumclay. Bermingham has spoken previously about the excavation of Drumclay, including to the Ulster Archaeology Society. Her stated aim was to present a ‘quick run through’ of the findings at Drumclay and to bring the audience ‘inside the crannog’. In thinking about how to approach giving this presentation, Bermingham said that she was struck by how, prior to the excavation of Drumclay, there was a certain amount known about how crannogs were built, but it was far from extensive. She admits that it wasn’t a question that she had particularly addressed, instead accepting the conventional wisdom of earlier archaeologists and antiquarians. However, the findings at Drumclay have forced a wholesale re-examination of these ideas, and her hope was that the audience would come away with a flavour of these new discoveries and insights. The crannog at Drumclay was situated in a small inter-drumlin lake, about 1.5km to the north-east of Enniskillen. The lake was roughly triangular in plan, measuring about 200m long and 200m at its widest. The location was first mapped by the Ordnance Survey in the middle of the 19th century and the locality was visited by the antiquarian William Wakeman in the 1870s. Unfortunately, at that time he was unable to physically get onto the crannog as drainage works had turned the lake into a ‘dangerous swamp’. Before the excavation all that was really known about the site was that it was a low mound, about 15m in diameter. Turning to the local landscape setting, Bermingham noted that the crannog was within 30m of dry ground that would have been perfectly suitable for building a rath or similar enclosure upon. This echoes a point made earlier by Claire Foley who observed that crannogs are not always associated with adjacent ringforts or raths, and this certainly appears to be the case here. At the beginning of the Phase 2 excavations the crannog was surrounded by a ring of ‘rock armour’ to prevent it from collapsing. Declan Hurl’s Phase 1 ill-starred excavation took place above the level of the rock armour, but the Phase 2 investigations necessitated the gradual removal of this layer as the excavation descended. One of the technical difficulties of the excavation was that the boggy marsh, though drained, was still being fed by a series of over-ground and underground streams that attempted to turn the excavation back into a natural lake. Bermingham, with wonderful understatement, describes it as a ‘logistical challenge to say the least’. While the crannog may have initially appeared as a low mound, about 15m in diameter, it got wider and larger as the excavation continued down. 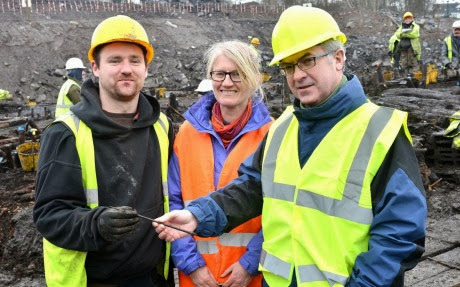 At the lowest level investigated, the crannog measured about 26m by 18m and was carried out in a 80m wide hole in the ground that was only accessible via ramps and had to be continually pumped to allow work to progress. But rather than dwell on the significant logistical issues, Bermingham wanted to talk about ‘how to build a crannog’, or more specifically ‘how to build this crannog’. The lowest layers of the crannog were built directly into the fine, dark, homogeneous lake muds. The first part of the construction process involved dropping piles of oak, alder, and birch into the lake bed. These piles were inserted in groups of between two and four poles and would have been inserted vertically, but over time they had been pushed over to approximately 45 degrees by the weight of the crannog structure. This movement of timbers is a feature of the crannog and Bermingham explained that the crannog always appeared to have been in motion to some extent. On top of these pile groups the crannog builders formed a series of interconnected platforms that acted as the ‘skeleton’ of the site. There was a large, central platform surrounded by a number of smaller satellite platforms. We don’t yet know the sequence in which these platforms were constructed, but they were all around 10-12m in diameter and they varied in thickness. The occupation evidence indicates that as soon as the piles and the platforms were in place people immediately started living on it. Bermingham emphasised the large volume of timber resources required to create each of these platforms. Showing a section through one of the platforms, she noted that each would have required hundreds of logs, laid in overlapping layers and retained by wattle walls. These were mostly alder, and all would have been gathered locally. We don’t yet know the exact building sequence and whether, after the vertical piles were inserted, the platforms were laid down and the retaining wattle walls built later; or if the basket-like wattle retainers were constructed first and the platform logs inserted within them. Interestingly, the platforms show a variety of construction styles, suggesting that they were created by different groups. Bermingham showed an image of one platform where the logs were carefully arranged in a geometric shape to create a circular platform, about 10m in diameter. A further example had logs laid parallel, with the longest ones at the centre, getting smaller towards the edges. A further type appeared to have been constructed with an open central area, about 2m square. These central areas are of significance, as this is where the hearths were located in the successive phases of houses built on the platforms. 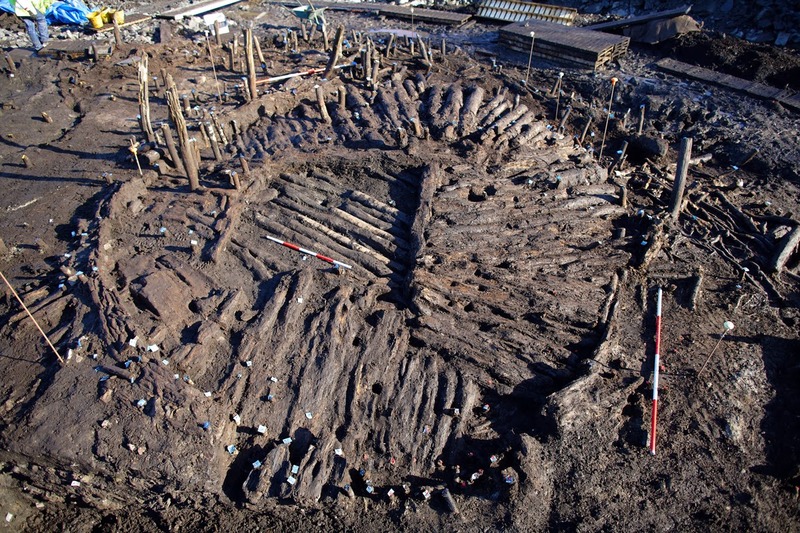 At least 53 of these platforms were recorded during the excavation and whether they were single, double, or triple-layered, they were being stacked ‘like pancakes’ as the crannog grew and developed. Each of these platforms were intended to take houses or other form of occupation. Two different house types have been recovered from the excavation: rectangular and round. The majority of the houses are round, and there are a number of examples of figure-of-eight houses, similar to those from Deer Park Farms. These are in the form of a large ‘front’ house and a small roundhouse extension on the back of it. Again, the post-excavation analysis is still attempting to pick apart the building sequence. This is of importance as there may be important implications for when rectangular houses may have been introduced on the site and into Irish archaeology generally. Although 18 houses have been positively identified, it is certain that this is not the full number of structures that stood here. Bermingham is of the opinion that in the lowest levels, where there are lots of wooden platforms and occupation evidence, that the occupants did a thorough job of dismantling the houses. At this level, we are simply not getting the evidence of superstructures that would be expected. The evidence may not have been there, but they must have had shelter! Either the occupants completely dismantled the structures, brought in more sediment to build up the ground, so they could build new houses or we’ve got to rethink how they were creating shelter on the crannog in the early phases. Either way, it is abundantly clear that the site was inhabited from the moment they started putting wood on the lake. The amount of waste also indicates that the occupants were very intensive and the people here were very busy. She says: ‘I don’t think this was a holiday home for three weeks in the summer when the midges weren’t bad. These guys were here and they were really seriously living, and working … all their everyday life was happening on that crannog’. We know that the houses were continually rebuilt on the same location and their distribution pretty much follows the layout of the platforms. This is because the hearths were central to the platforms and the houses were built around the hearths! While the hearth remained in the same location, the houses only moved marginally about the platform site. Unfortunately, we still don’t know how many houses were standing on the site at any one time, but Bermingham is of the opinion that we’re not talking about having one principal house surrounded by a series of out-buildings. Instead, she sees that it is more likely that we’re talking about a series of houses – perhaps between three and five – simultaneously occupied on the crannog. Perhaps these houses would have had different functions – we don’t know who lived where on the crannog. At Deer Park Farms the main path that led to the central house gives the impression that it was the resident of the most important person on the site and the same is probably true at the central house at Drumclay. In showing a series of images of the circular and rectangular houses from Drumclay, Bermingham remarked that the same survival of high-quality door jambs that was observed at Deer Park Farms is not replicated here, perhaps because the valuable oak timbers were more effectively reused and recycled. In common with Deer Park Farms, there is little evidence for internal roof supports. Several houses show evidence for internal sub-division, so it is clear that the internal spaces were demarcated for different reasons and different tasks. Again, more research is required to fully understand how these spaces operated and what they were used for, including identifying where the occupants slept. One of the most common features on the site are the heaths. There are a number of rectangular, stone-lined examples, typically with clay bases. Others have stake-holes, indicating the locations of a spit or frame for suspending a pot. Bermingham illustrated a number of unusual timbers termed ‘slotted-beams’ where a large pole has a series of stakes jammed through it and into the ground surface. At Deer Park Farms it was suggested that these may have been used in the production of flax, though a number of other possible uses are also possible. As the Drumclay examples are always found in association with hearths, it is possible that they were used in some way to regulate heat from the heath. The crannog was pretty much crammed with structures and activities of all types. To make your way from one part of the site to another, the occupants created a series of pathways. Bermingham showed an image of a particularly finely-made example in the south-west of the crannog, constructed from silt and stone, though the majority appear to have been built of wood. As the mound evolved and became a ‘great big muddy compost heap’ the occupants tended to use less wood to provide solid foundations. Instead, the occupants used more clay to build up floors and platforms and in so doing they created a much drier and more stable place. Not only was Drumclay a home for the living, but in time it also became the home for one set of human remains. Analysis suggests that the skeleton was that of a young woman, about 18 years at the time of death, who was buried in a shallow pit adjacent to a house. The skeleton has been radiocarbon dated to 14th to 15th centuries (1309-1439 cal AD). At the time this woman lived, people were most usually buried in consecrated ground, so finding an irregular burial tucked away like this is intriguing and unusual. Initial investigations by Dr Eileen Murphy at QUB indicate that the young woman had suffered a number of periods of stress in her life, but much more work remains to be done on this individual. In terms of dating, Bermingham notes that there are an initial set of radiocarbon dates that provide a coarse chronology of the site. Dates from three of the platforms indicate that the site was established in the late 6th to 7th century (676-866 cal AD, 695-887 cal AD, and 695-942 cal AD), but these are not from the earliest levels and these remain to be dated. However, we can be sure that Drumclay was thriving at the same time as the nearby monastery at Devenish. It was flourishing during the 9th century when the ambo sculptures were carved at White Island. One house dates to the late 10th to 12th century (995-1153 cal AD) which is significant as this was a particularly turbulent period in the local area characterised by frequent warfare and burnings as local dynasties fought for supremacy. This, essentially, continued until the Maguries emerged as the dominant power in the area in the 13th century, and Drumclay has a house of similar date (1213-1279 cal AD). The house adjacent to the skeleton (& is broadly contemporary with it) dates to the 14th to 15th century (1326-1443 cal AD) and indicates that the site was intensively occupied during this relatively late period. This would make the occupation here contemporary with the establishment of the Maguire stronghold at Enniskillen, and probably with the construction of their castle in the early 15th century. But the story does not end there as above the layers dated to this period was another metre of archaeological layers and features that include further structures, hearths, artefacts etc. Thus, the crannog was probably in use and a focal point of the local landscape until well into the 16th century. Turning to acknowledgments, Bermingham thanked the fantastic site crew for doing a remarkable job in particularly trying conditions. In particular, she thanked the public – both those who attended the conference and visited the site – for their interest in and support of the site and the excavation.